Killarney National Park was first opened to the public in 1964 on foot of a generous bequest to the Irish nation by the Bourn family in memory of their daughter Maud, who had received Muckross House, the jewel in the parks 11,000 acre crown, as a wedding gift from her parents Vincent and Frances Bourn. It has since been enlarged and now comprises a total of 25,000 acres of Kerry’s most scenic parkland, with 40kms of internal roadways and 70kms of cycle/walking paths. While you can begin to imagine the scale it is quite impossible to do the scenery justice in these few words. Killarney National Park is absolutely beautiful and unrivalled in Ireland as a recreational facility for both locals and visitors alike. With everything one might expect in a (slightly) tamed wilderness, majestic mountains towering over deepfresh water lakes teaming with shard (a species of fish not found anywhere else in the world) and wild Atlantic salmon. Trout filled rivers flowing through the oldest oak and yew woods in Ireland, which are ablaze with wild pink and purple rhododendrons in early summer. Killarney National Park even has its own tree, the Arbutus or ‘strawberry tree’ fern and shamrock species, and as you can imagine wildlife galore. White-tailed eagles have been re-introduced (the golden eagles were hunted into extinction) and are now breeding successfully and the current herds of red deer which roam freely are the direct descendents of the original native Irish species.There is a huge amount of outdoor activities available including walking, hiking, mountain biking, kayaking, abseiling and the more leisurely pursuits of golfing and fishing. But by far the most popular seems to be casual walking which works for all ages and abilities. Indeed, I have never seen so many fit, lyrca clad bodies elsewhere in Ireland, as in Killarney. Catherine Treacy, who owns and runs the charming and extremely comfortable Killarney Lodge Guesthouse which couldn’t be more conveniently located just opposite the gates to the Killarney National Park on Countess Rd. Catherine was kind enough to share with me some of her favourite walks which she and her friends are fortunate to do everyday. In fairness she had the decency to admit that even they were often spoiled for choice, talk about green.…with envy ! 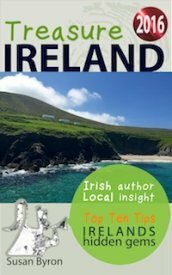 A typical day for Catherine and her friends, might begin with a ring around Muckross Lake, stopping of at the delightful Dinis Cottage for coffee. Mind you their preferred evening or sunset walk (if you don’t mind) is around about Knockgreer House and Gardens and on out to Rosse Castle. For a more challenging walk they like to hike up the face of Torc Waterfall or slip into park at Derrycunnihy for a brisk 5 miler as far as Lord Brandon’s cottage and all of this before lunch, please? I am exhausted thinking about it. But it is definitely a walkers paradise and if you would like any more information please contact Catherine at the link below. 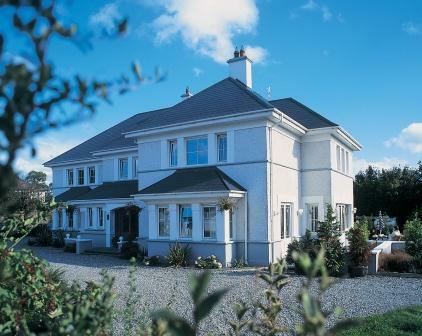 1 Killarney Lodge Guesthouse just outside the park gates, wonderful b&b, owner Catherine Treacy is a seasoned walker who will be able to advise you on all the best walks as well as looking after you. 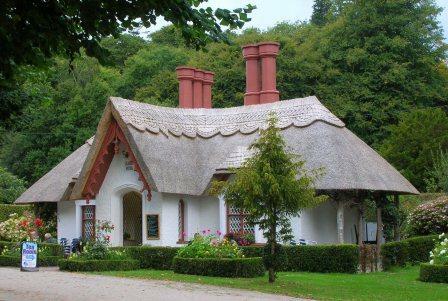 2 Deenagh Lodge that beautiful thatched cottage above, is just inside the park gates a little further along the avenue. It is run by Downs Syndrome Young Adults and is a very friendly and popular place to have lunch or a coffee. 3 Similarly Dinis Lodge further on into the park is a great place to eat but don’t forget to check out the window where dozens of engaged couples have scratched their initials, the earliest dating back to 1850. 4 Take some time out to stand on the ancient stone bridge at the Meeting of the Waters where the lakes of Killarney converge and watch the boats coming through. 5 Hike further on up to Lord Brandon’s Cottage, a former hunting and fishing lodge where you can get more light refreshments. 6 Before taking on the Black Valley, a brooding formerly isolated valley that you can walk or take a pony and trap ride through. 7 Which in my opinion is the most pleasant and only way to do the legendary Gap of Dunloe. 8 Kate Kearney’s Cottage (another pub) marks the end of the Gap and turning point for the horse and where your tour bus will pick you up. 9 Tollymore Woods, the most ancient oak woods in Ireland close to here are currently been developed with more trails and should be opened for next year to the public. 10 Torc Waterfall is on the road South to Kenmare, signposted on the left hand side, you can walk to the bottom or hike up to the top if you are feeling fit. 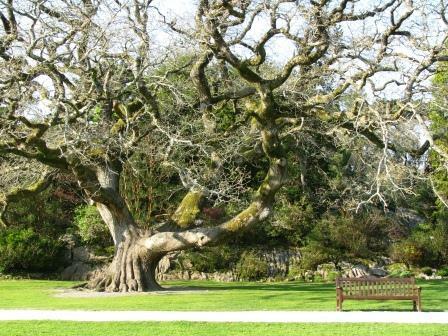 For more information on Killarney National Park please click here.